Dr. Mark T. Mitchell, a prolific scholar, has been named Patrick Henry College's new Dean of Academic Affairs. Purcellville, VA, March 29, 2019 --(PR.com)-- Jack W. Haye, President at Patrick Henry College names Dr. Mark T. Mitchell as Patrick Henry College’s new Dean of Academic Affairs. This announcement comes a few short weeks after the sad and sudden passing of Patrick Henry College’s former Dean, Dr. Frank Guliuzza, on February 26, 2019. Mark T. Mitchell has served as a Professor of Government at Patrick Henry College since 2002 and as Chairman of the Department of Government since 2010. A prolific scholar, Dr. Mitchell is the author of The Limits of Liberalism: Tradition, Individualism, and the Crisis of Freedom, The Politics of Gratitude: Scale, Place, and Community in a Global Age, and Michael Polanyi: The Art of Knowing. He is co-editor of Localism in the Mass Age: A Front Porch Republic Manifesto, The Humane Vision of Wendell Berry, and The Culture of Immodesty in American Life and Politics. He is the co-founder of the web-zine Front Porch Republic. Dr. Mitchell earned his undergraduate degree in history from Crown College before earning his M.A. in Philosophy from Gonzaga University. He then studied at Georgetown University, graduating with both an M.A. and Ph.D. in Government. In 2008-2009, he was a fellow at the James Madison Program in American Ideals and Institutions at Princeton University. 1. Les Sillars (Ph.D., University of Texas-Austin), Professor of Journalism since 2002, has accepted a new role as Associate Dean of Academic Affairs and Chairman of the Department of Applied Liberal Arts. 2. Mike Haynes (Ph.D., University of Tennessee), Professor of Government since 2008, has accepted a new role as Chairman of the Department of Government. 3. Doug Favelo (Ph.D., University of California–Los Angeles), Associate Professor of History since 2010, has accepted a new role as Chairman of the Department of Classical Liberal Arts. 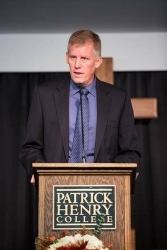 Patrick Henry College offers a classical Christian liberal arts program with high academic rigor, fidelity to the spirit of the American founding, and an unwavering biblical worldview. Additionally, Patrick Henry College provides one of the top pre-law programs in the nation.